Webster Little Rock hosted the event in the auditorium of Bank of America Plaza, where the metro campus is located. 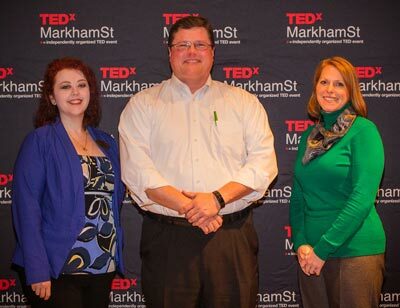 Webster University's Little Rock area campuses recently partnered with Little Rock’s TEDx franchise, TEDxMarkhamSt, to host its first student speaker competition. The competition was open to all students, high school, college, graduate, and post-graduate. Six students participated. Prior to speaking before a panel of judges on Feb. 27, students submitted a 500-word description of their “Big Idea.” The student winners will be invited to speak at the 2nd Annual TEDxMarkhamSt Conference on Friday, Sept. 29, 2016, at the Ron Robinson Theatre. Both the conference and the student competition were launched and organized by TEDxMarkhamSt Founder, Salil Joshi. Joshi is a dual MPS/MPH graduate student at the Clinton School of Public Service and the University of Arkansas for Medical Sciences. The Little Rock area campuses hosted the event in the auditorium of the Bank of America Plaza, where the metro campus is located. Webster staff and faculty promoted the event on campus and via social media. "I hope this is the beginning of a long partnership between Webster and TEDx in Little Rock," said Kelly Lyon, Webster Little Rock area director. "We all benefit from hearing new and big ideas so it’s exciting to play a supporting role in something so important to our community." Lyon recruited judges for the competition. "The students are clearly the ones we want to elevate, but we couldn’t have a competition without judges," she said. In the spirit of "ideas worth spreading," TED has created TEDx. TEDx is a program of local, self-organized events that bring people together to share a TED-like experience. Our event is called TEDxMarkhamSt, where x = independently organized TED event. 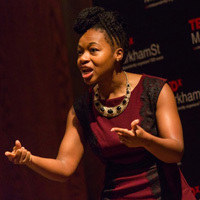 At TEDxMarkhamSt, TEDTalks video and live speakers will combine to spark deep discussion and connection in a small group. The TED Conference provides general guidance for the TEDx program, but individual TEDx events, including ours, are self-organized.